Peyton Manning did it again. He threw a bunch of interceptions, just like last week. He threw four interceptions along with two touchdowns. Overall, he was 36-of-48 for 365 yards, finishing up with a 75.4 rating. It was way better than last week, however, the fourth pick would be the worst of it. With overtime in, the Colts made a great defensive stop on Dallas to force a punt. Indy was facing a crucial third down and four near midfield. Manning forced a throw in to Jacob Tamme with two Cowboy defenders around him, which forced a pick. Mike Jenkins tipped the pass which would result in linebacker’s Sean Lee’s hands for his second pick. He would take it back past midfield. Dallas would drive down the field to hit a 38-yard game-winner for a 38-35 win in overtime to improve to 4-8. Indianapolis now falls to 6-6. But I loved the effort Indy put into this game. The Cowboys made an easy first drive, which resulted in a Tashard Choice twelve-yard touchdown to put Dallas up 7-0. 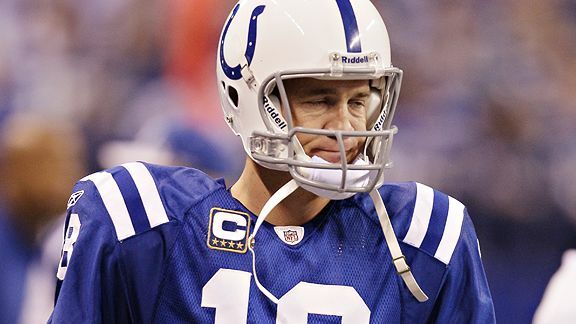 Peyton Manning would go long and throw an interception for the first drive on Indy. Kicker David Buehler would then notch up three points for the ‘Boys to put them up 10-0. Manning would throw another interception then in the second quarter to Orlando Scandrick, which would end up for a 40-yard return to the end zone to bring Dallas’ lead up to 17-0. 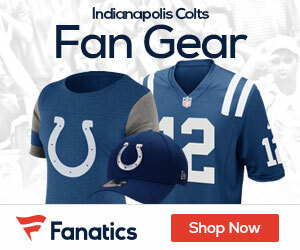 But Manning and the Colts would fight back, and Manning would hook up with Pierre Garcon for a 13-yard touchdown to cut the deficit to 17-7 with about two minutes left in the first half. Coming into the second half, Indy went out strong. Manning would find Reggie Wayne open for a long, 34-yard bomb to cut the deficit to 17-14. Dallas would march back, but Indy would make a great defensive stand. Dwight Freeney almost sacked quarterback Jon Kitna as he overthrew Miles Austin. If Austin knew the ball was coming to him, Dallas would be up 24-14 by now. Instead, another field-goal was in to put them up 20-14. Indy would struggle then. Piled on by penalties, Manning would struggle. There, he threw an interception to Sean Lee, as he took it 31 yards back for a touchdown. It was now 27-14, Cowboys. However, Indianapolis would come back and Manning would drive Indianapolis down the field. He would eventually hand it off to Javarris James for a one-yard score. Indy was now back in the game, 27-21. After a strong defensive stand, wide receiver Taj Smith made a huge play on special teams. Smith was on the team’s practice squad for the past couple of years. Smith would block the punt and return for a touchdown to put Indy up, 28-27! In the fourth, however, Dallas would take control. Dallas would reach the point to the goal-line. But that is where it changed the game. After three big run-stops with Indy’s goal-line stand, Dallas had to kick a field gaol. Buehler made it, but the Cowboys were called for a false start. Buehler would make the kick again, as Dallas was now up 30-28. However, Eric Foster made an illegal move as he jumped over a Cowboys’ offensive lineman so he could try to block the field goal. With this, it was a leverage penalty and Dallas would get first and goal with a new set of downs. Just think that the Colts could have won like 35-30, but Foster made a huge mistake. But Dallas would get a touchdown on third-and-goal with a Jason Witten catch. Dallas would go for the two-point conversion, finding an open Roy Williams for the successful conversion. It was now 35-28, Cowboys. With about two minutes to go, the Colts had to drive down the field. Manning would hook up with Reggie Wayne multiple times, showing how great of an All-Pro receiver he is. Manning would then hand it off to Javarris James at the goal-line for a touchdown to tie the game at 35. With 29 seconds left, the Cowboys’ returner fumbled the ball thanks to no other than special teams warrior Taj Smith. But the Cowboys would miraculously recover. With 21 seconds left, Dallas would run down the clock to force overtime. With overtime here, the Colts won the coin-toss. Indy would have a good drive, but they would fail on third-and-four as Wayne dropped the pass. Indy would punt and make a strong defensive stand on the Cowboys. Manning would throw an interception, which would end the game. During the pick, when you look at the replay. Wayne was clearly a lot more open than Tamme. Manning should have gone with Wayne on that play. But hey, I guess he will notice that when he looks at the film. Something is wrong with Manning. I have never seen him play this game. This marks 13 interceptions in the last five games with eleven in the last three. That leads the league! Manning has 24 touchdowns and 15 picks for the year. Ouch. If Manning keeps this up, he’ll be in for a 20-plus interception season, something he hasn’t had since his rookie season when he had 26 touchdowns and 28 interceptions. Manning has to fix himself. But the Colts also have a problem with staying healthy. I suggest signing a good lineman or two and a receiver if they keep struggling. Manning can’t keep throwing to Jacob Tamme, Reggie Wayne, and Pierre Garocn all the time. I suggest signing a guy like Antonio Bryant. Manning needs some targets. Next season, Indy needs to completely change their offensive line. It’s terrible, and that is what is also leading to some of those interceptions. Other key free agents that are receivers include Kevin Curtis and Domenick Hixon. Indianapolis still has a good chance of making the playoffs, but they have to win the rest of their games to do so. If they beat Tennessee next week, they stand at 7-6 as they head back home to host the Jacksonville Jaguars. If the Jags win or lose in Week 14, Week 15 between these two teams will be the battle for who wins the AFC South. And if Indianapolis wins and beats the Oakland Raiders and Tennessee Titans there-after, they are in the playoffs. But at 6-6 and how they are playing right now, they could be out of the playoffs for the first time since 2001 when they went 6-10. Indianapolis needs to fix themselves now. If they want to win, adjustments happen this instant. Is Manning becoming Brett Favre?